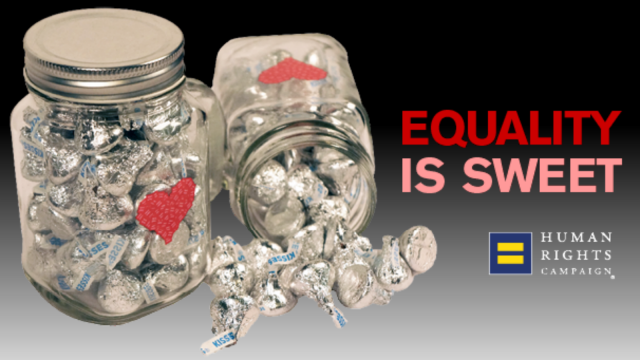 This Valentine’s Day, celebrate your sweetheart by sending them a gift in the name of equality! 2015 was a historic year for advancing equal rights but it was also proof that we still have work to do. There is still very real discrimination and even violence occuring every single day to LGBTQ people. Even now in 2016, LGBTQ people are still denied their most basic rights every day. This Valentine’s Day, join HRC in the fight for full equality by sending your loved one a limited edition HRC Sweetheart Mug. A donation of just $35 will make your loved one a member of HRC for one full year, and right in time for the holiday, we’ll send them a limited edition HRC Sweetheart Mug filled to the brim with Hershey Kisses™. They will also receive a personalized card, an HRC logo bumper sticker and a subscription to our quarterly magazine, Equality. We believe in love and equality. If you share the same beliefs, share this message with your loved one this Valentine’s Day by giving the gift of membership. But don’t delay! Send your sweetheart their Sweetheart Mug today! LGBTQ people across the globe who depend on HRC are counting on you for your help. **This product is a Mason Jar Mug (with handle) and made of glass. **Donations must be made by February 8th, 5 PM EST to guarantee delivery by February 14th. **HRC is unable to ship internationally or to PO Boxes.